The survivors split into teams of two for a Reward Challenge which turns into this inspirational edit of Cirie crossing a balance beam, even after her tribe loses by a landslide. Meanwhile, Michaela is sitting on the sidelines because she wasn't chosen in the schoolyard pick. The good news: there's a big ol' Secret Advantage right by her feet. Bad news: she never notices the parchment. But Sarah definitely sees it and when the challenge is over, she swims on over and slickly hides the advantage in her shoe. The advantage is later revealed to be the return of the vote steal, which is non-transferable and can played until the final five. Brad, Debbie, Sierra, Aubry, and Andrea take a plane to their delicious reward feast, which allows Aubry to indulge and callback to her famous coleslaw. As Andrea discusses the friction between her and Zeke, Sierra feels more confident than ever in her alliance of six. Back at camp, Cirie tries to show Sarah that being on the bottom of that six is a bad move and Brad/Sierra are calling the shots. Sierra offers Sarah a final three with her and Debbie, but when Sarah has little say in the week's target, she wonders if this is the week to make her move. But a target naturally presents itself when Debbie approaches Aubry and throws Sarah under the bus in the process. Aubry totally sees through Debbie's move and quickly calls her alliance together to tell them the latest of Debbie's tales and arrogance. With this info in her mind, it's time to wonder: whose side will Sarah pick? Tribal Council time! Probt opens the night by explaining that as the jury begins to build, every Tribal Council is the opportunity to make your case to win. 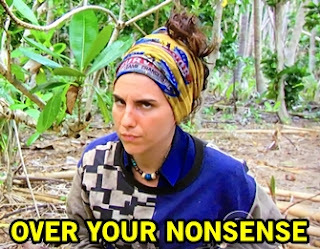 Andrea knows she's vulnerable because she was so close to winning immunity but dropped her "IMMUNITY" blocks, allowing Troyzan to get the win. 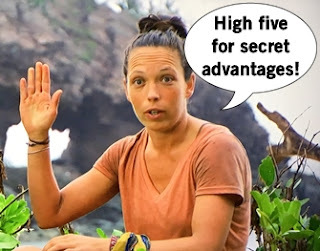 Zeke calls out the alliance of six that's running the game, and Debbie's cockiness is at a peak high about their "solid six". Sarah explains it's about being on the right side of the numbers and feeling confident in that group, which Debbie agrees and tops off with more of her trademark hubris. 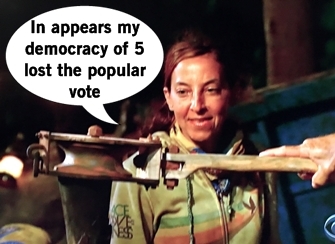 Michaela urges everyone to make a move while there are numbers or look dumb, then enjoys some coconut popcorn as the votes are read. It's a rude awakening for the six, I mean five, when Debbie is blindsided out of the game.